A party of adventurers in Tales of Trolls & Treasures. A party is a group of characters adventuring together in a role-playing game. In tabletop role-playing, a party is composed of a group of players, occasionally with the addition of non-player character allies (sometimes called henchmen) controlled by those players or by the gamemaster. In computer games, the relationship between the party and the players varies considerably. Online role-playing games or MMORPG parties are often, in the above sense, of the same constituency as tabletop parties, except that the allies are always controlled to a lesser or greater extent by the computer AI. In single-player computer games, the player generally controls all party members to a varying degree. 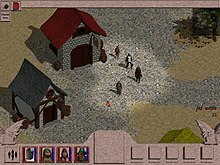 Examples of games which have parties include the tabletop RPG Vampire: the Requiem, the single-player role-playing Baldur's Gate series, MMORPGs such as World of Warcraft, Anarchy Online and Warhammer Online, and the multi-player computer action-RPG Final Fantasy XI. Resource management is a crucial part of role-playing games, and any player-controlled character, whether they can participate in combat or not, are always useful if they have the ability to carry heavy or bulky items. Non-player characters used by the player with only this purpose in mind are called mules or sometimes bots, although bot is alternatively used to describe non-player characters whose sole use is their ability, usually with spells, to enhance other characters statistics or abilities. Usually, however, and exclusively in tabletop and single-player games, party members are a valued part of the player's tactical potential. Since the advent of three-dimensional and isometric computer environments in games, the use of parties and computer AI control of non-player party members has increased. Exceptions to the latter include Final Fantasy XII (itself an exception to the rest of the series in that combat and travel takes place in the same 3D environment), in which the default actions of all members of the party follows behaviour scripts bought with game money and customized by the player, unless the player took control of party members and specified their actions. This page is based on the Wikipedia article Party (role-playing games); it is used under the Creative Commons Attribution-ShareAlike 3.0 Unported License (CC-BY-SA). You may redistribute it, verbatim or modified, providing that you comply with the terms of the CC-BY-SA.